The Welsh Springer Spaniel was first recognised by the UK Kennel Club as a breed in its own right in 1902. However, history shows through art and the written word that a ‘red and white’ Spaniel existed from 1560. The Welsh Springer Spaniel is a multi-purpose gundog, primarily flushing out game and retrieving it back to the shooter, either on the land or the water. Welshies are a fairly good with other dogs and cats, provided the owners are consistent and thoughtful to the hierarchy of the household. However, bear in mind that it is a gundog and will show a ‘real interest’ in birds and rabbits. 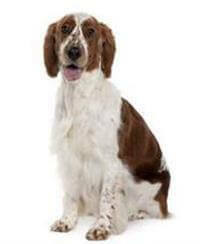 Welsh Springer Spaniels can suffer from hereditary problems such as hip dysplasia, eye diseases and epilepsy. Both parents should be X-rayed and hip scored. Both parents should have a current ‘specialist’ eye certificate.